Iatrogenic causes predominate in the development of ureteral strictures. Gynecologic and general surgical procedures are widely considered to be common causes of uret-eral trauma and stricture formation, but endourologic procedures (such as uretero-scopy or ureterolithotomy), which facilitate less invasive management of many conditions, may paradoxically cause ureteral injury (135-137). A 1% to 11% incidence of stricture formation has been reported after upper tract endoscopy (138). Selzman and Spirnak (139) found that urological, gynecological, and general surgical procedures accounted for 42%, 34%, and 24% of ureteral injuries, respectively. Of the urological injuries, 21% occurred during open procedures and 79% during endo-scopic procedures, most commonly stone removal (Fig. 4). 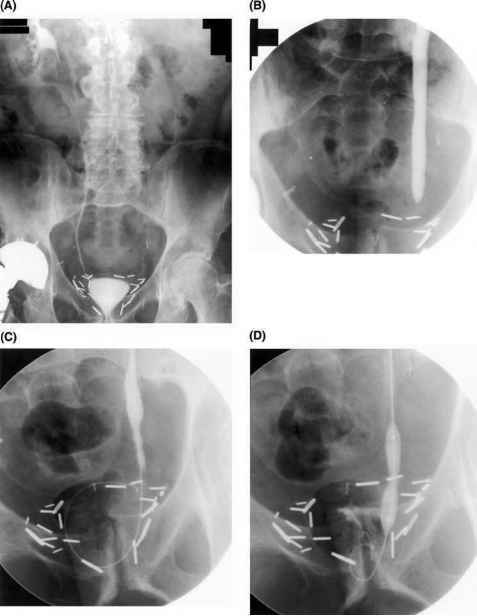 Urologic procedures that have been implicated in ureteral stricture formation include transurethral resection of the prostate, radical prostatectomy, ureteral mea-totomy, traumatic ureteral catheterization, ureteroneocystostomy, and renal transplantation. Gynecologic procedures that have been associated with strictures include hysterectomy (for benign or malignant disease), cesarean sections, and tubal ligations. Selzman and Spirnak (139) found that radical abdominal hysterectomy accounted for most of the gynecological injuries in their series. Surgical procedures that may cause ureteral trauma and stricture formation are abdominal aortic aneur-ysm repair, bowel resection, and pelvic exenterations. Selzman and Spirnak (139) found that colorectal surgery and abdominal aortic surgery accounted for most of the ureteral injuries during general surgery and that these injuries were transections (in 62% of cases). Ureteral strictures can also develop in patients with chronic calculous disease as well as after penetrating abdominal trauma, particularly high-velocity gunshot wounds. Urinary extravasation and ureteral ischemia may contribute to scar formation in these cases and in postoperative strictures (such as ureteroenteral anastomotic strictures associated with urinary diversion). Chronic inflammatory diseases, such as tuberculosis and schistosomiasis, can also cause strictures. With malignant strictures, the goal of treatment is to provide drainage (percutaneous or internal) so that renal function can be improved. Chronic stenting is often the most reasonable option for these patients. For benign strictures, stenting alone is not the optimal therapy, and attempts are made to relieve the obstruction, with balloon dilation often being the initial mode of therapy. Successful balloon dilation obviates the need for chronic indwelling stents or additional open surgery. Ureteral dilation can be performed through either an antegrade or retrograde approach or a combination of these two approaches. The antegrade approach is the preferred route, for several reasons. Many strictures that may be impassable by a retrograde approach can be negotiated in an antegrade fashion. More importantly, once dilation and stenting have been completed, the remaining nephrostomy tube can be used to assess the results of the dilation as well as to perform urodynamic tests (such as the Whitaker test) for more physiologic evaluation. The only disadvantage of the antegrade route is the invasiveness of establishing a percutaneous access tract (Fig. 8). The retrograde approach is the least invasive method of management. Access can be gained by either cystoscopy or ureteroscopy, during which time a retrograde catheter is inserted. This catheter can then be exchanged for guidewires and balloon dilators. For dilation, reinforced high-pressure balloon catheters are used. A "waist" deformity is seen in the balloon on initial inflation and should disappear with continued or subsequent inflations (Fig. 8D). There is no consensus in the literature regarding the most effective method of dilation, the optimal size of balloon to be used, or the inflation period for the balloon. In experimental studies (140), dilation of the ureter to twice its diameter was well tolerated, but threefold dilation produced changes ranging from hydronephrosis to complete rupture. Inflated balloon diameters in published reports range between 4 and 10 mm, number of inflation cycles from 1 to 10, and the duration of inflation from 30 seconds to 10 minutes (138) to as long as 1 to 16 hours in different series. Similarly, there is no uniformity regarding the number of inflations that should be performed. The various technical approaches have been summarized in reviews by Meretyk et al. (141,142) and Chang et al. (143). After dilation, there is no consensus regarding the necessity for stenting, with some authors leaving in stents for several days to months and others avoiding stent-ing altogether. Laboratory studies of ureteral healing demonstrate reepithelialization in 7 to 10 days and muscular healing in six to eight weeks. Thus six weeks of post-procedural stenting appears prudent because the stent serves as a scaffold for organized reepithelialization and smooth muscle growth (144). In published reports, stent sizes have varied between 6 and 16 French, and stenting duration has varied from 2 days to 12 weeks (138). The ultimate outcome may depend more on the nature (and etiology) of the stricture than on the technical nuances of dilation. If a stent is placed after dilation, a 7 to 10 French size is used in native ureters and 6 to 8 French size in transplanted ureters. Figure 8 A patient with left distal ureteral stricture following ureteroscopic stone retrieval from left distal ureter (same patient as in Fig. 4). 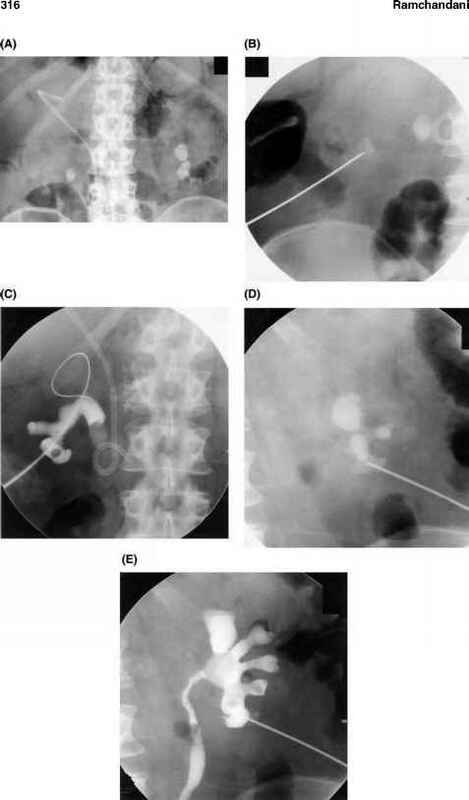 (A) There is a high-grade obstruction of the left renal collecting system on IVU with no discernible excretion, one month after uretero-scopic stone removal. (B) A PCN was performed, and a catheter advanced into the distal left ureter where contrast injection showed complete occlusion, with no flow into the bladder. (C) A guidewire was maneuvered across the stricture. A hydrophilic wire is very useful in this situation. (D) Balloon dilation shows a waist in the balloon at the stricture site that was effaced with continuing balloon inflation. A nephroureteral catheter was placed following the procedure (Fig. 5A). The stricture did not respond to balloon dilation, and the patient is being managed with a nephroureteral catheter. Abbreviations: IVU, intravenous urogram; PCN, percutaneous nephrostomy. stents (external-internal stents) are preferred over completely internalized stents (Fig. 5). They are initially left to gravity drainage and can then be capped. The patient is asked to uncap the tube if flank pain, fever, or drainage around the catheter develops. The stent is exchanged for a nephrostomy catheter at the end of six to eight weeks. The efficacy of the dilation can then be assessed by nephrostograms and urodynamic studies before catheter removal. The tube can be safely removed if the opening pressures are low (less than 14 cm of water), the renal pelvic residual volumes are low, and the stricture itself appears to be anatomically improved, with satisfactory flow through the previously strictured segment. If follow-up studies demonstrate a recurrent stricture, a second attempt at dilation is usually made. Subsequent failures are managed with either open surgical repair or chronic stenting, depending on the circumstances. When balloon dilation is apparently successful, follow-up intravenous urogra-phy or renal scans are performed at 1, 6, and 12 months and then periodically, as indicated, to check on the continuing patency of the ureter (145). Percutaneous ureteroneocystostomy and direct percutaneous ureteral puncture are other techniques that have been used in the management of impassable ureteral strictures (109-111). Electrocautery and rotational atherolytic devices have also been used to recanalize occluded ureters and stenotic UPJs (146-148), but their efficacy remains to be proven. Can a indweling catheter be habit forming?